Which languages rule the internet? Google recognises the most languages, across its Translate and Search services – with 348 languages supported on Google Search. The following infographic from Statista explores how some of the world’s biggest websites deal with the globe’s linguistic diversity. In terms of social media websites, Facebook recognises the most languages – some 120 in 2015. These include Afrikaans, Albanian and Azerbaijani through to Turkish and Vietnamese. 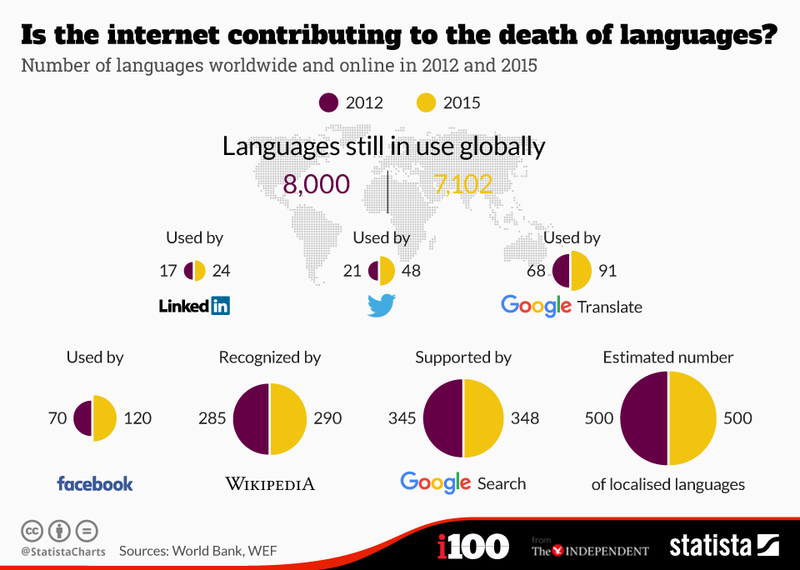 Next is Twitter, with 48 languages in 2015, while LinkedIn only supports 24 languages – just 0.3% of the world’s total. Wikipedia sits in between Google and Facebook, with 290 languages recognised.